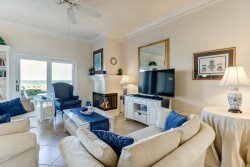 Don't miss this amazing seaside retreat that offers stunning views from the 3rd floor of Ocean Place condominiums located next door to the Amelia Island Ritz Carlton. Ocean Place is a gated community in Summer Beach (built in 1997). Spanish Oak Trees drape the streets leading up to the development, giving it a unique charm. Renovated in 2016, this condo now features a modern and fresh design, brand new appliances, and brand new furniture. Once inside you will enjoy the open floor plan with 10 foot ceilings and a breathtaking view of the ocean. Access the large 25.6' x 10.4' private balcony from both the master bedroom and living room to enjoy expansive views that stretch for miles along the shore, both north and south on lovely Amelia Island. This balcony provides the perfect private setting to enjoy the spectacular colors that canvas the Atlantic skyline at sunset. Or begin your day watching the beautiful sun rise over the ocean. Both the master bedroom and living room provide wall to wall sliding glass doors that allow a full view of the ocean, beach and sand dunes. Sleep with the sliding glass door cracked to enjoy the crashing sounds of the ocean waves pounding on the beach. Take the elevator or steps down to gain access to both the beach and pool. Ocean Place offers two oceanfront pools available for your enjoyment. Access the beach by taking a short stroll over one of the wooden walkways conveniently located just outside the pool areas. Ocean Place is located on the eastern side of the island in Summer Beach along the sandy beaches. Walking and biking trails connect most of the Summer Beach communities on Amelia Island. These trails are lined with lush green foliage and are available for your enjoyment if you need a break from the sun. The intercostal waterway and marshlands are located along the western edge and are within walking distance. Whether you are looking for a romantic getaway, the perfect family vacation, or just time away with friends, this condo is the place to be! Call us at Amelia Rentals and let one of our team members help you make those special memories.